I found this recently when running GPO modelling and there is a Microsoft article that describes the symptom caused by using the GPO registry wizard to import registry settings. Unfortunately I was not able to find a quick way and had to look through all GPOs for the Registry Wizard Values key. Underneath this key, the offending item has a blank type/ value name. 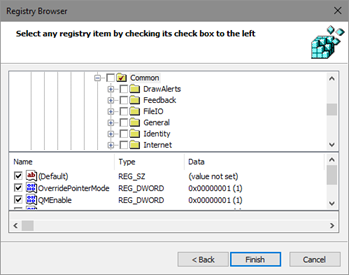 Note the entry named “Common”, with a green registry icon. This is the offending entry, generated by checking the box next to the key named “Common.” In the screenshot above in your post, the PublisherBypassList entry was generated by checking the box beside a key named PublisherBypassList, as evident from the expanded Registry Wizard Values tree in the screenshot. Here’s script I to find the entries with no type. A bit quick and dirty but it’ll do the trick.